Yes, I have been AWOL from the blog, but really... it has been busy... crazy (!) on my end of things. 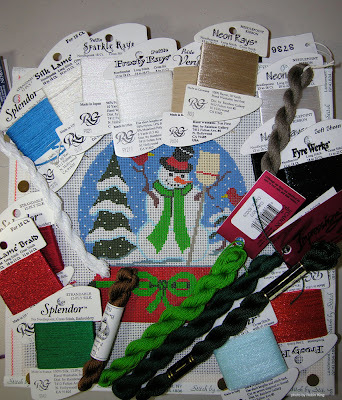 Jody Budman, owner of Needle in a Haystack, invited me to teach at her shop while I was on the west coast attending TNNA's Winter Market. 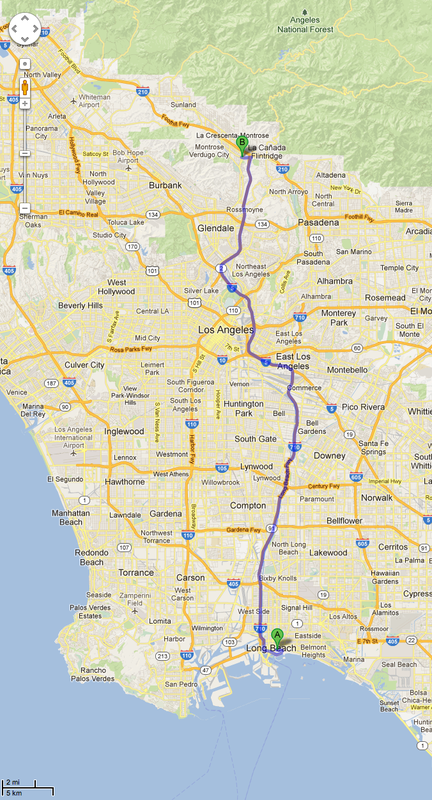 Montrose, CA is a manageable distance from Long Beach. Google says it is about 37 miles. Needle in a Haystack is a lovely combo store: both Needlepoint and Knitting. I am a wanna-be knitter; truly admire the talents of those who can knit. 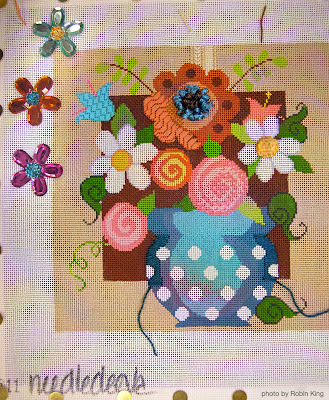 The class was Sunflower and Berries (ND 309) by NeedleDeeva. 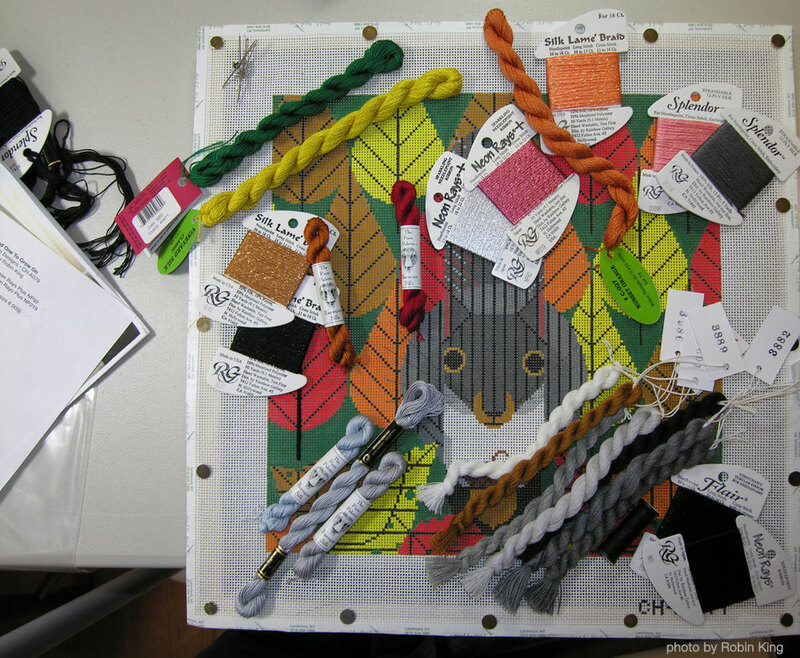 Stitch Guide by Robin King. The ladies learned Stumpwork, Ribbon Embroidery, Stacked Beads and some fun composite stitches. Thanks to Jody and her wonderful customers who made me feel at home. I enjoyed my visit and look forward to seeing all again. It was time to head home to Memphis. 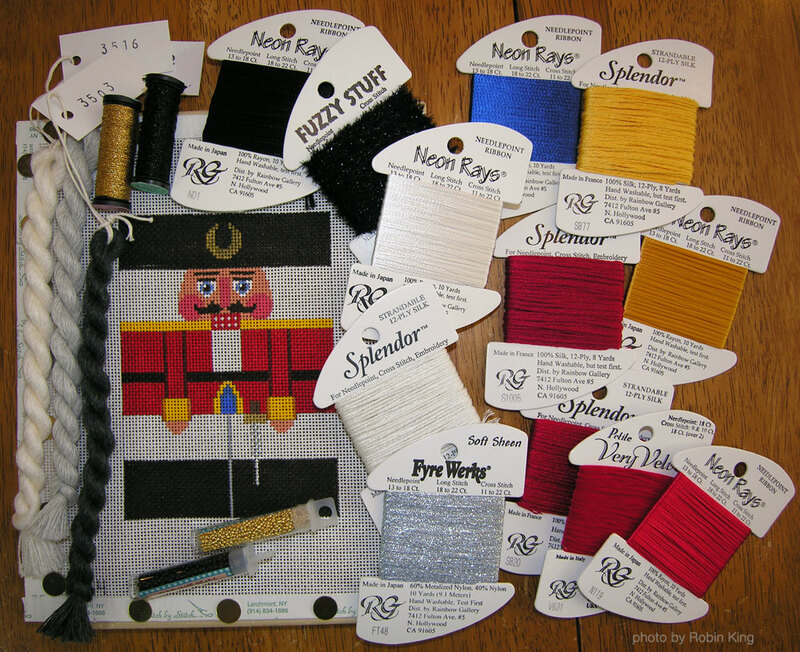 After all, I had been gone almost a week for the TNNA Market. 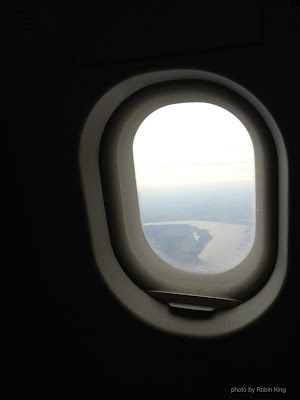 Here's a view of the Mississippi River seen from the airplane window as we approached Memphis. I had a nice welcoming from Pat and the Mews. 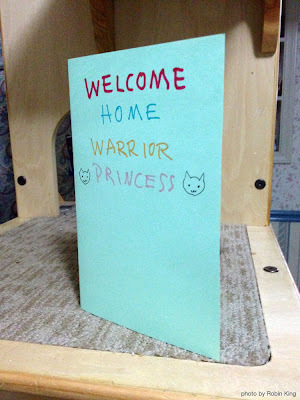 Seeing this card really warmed my heart. Greetings from Pat is so much better than Hallmark. I was home for a few weeks. Working on projects and deadlines. But, soon, it was time to pack and teach again. Where to you might ask? Needles and Threads of Ruxton has so many threads! Judy really knows how to utilize the vertical space in her shop. 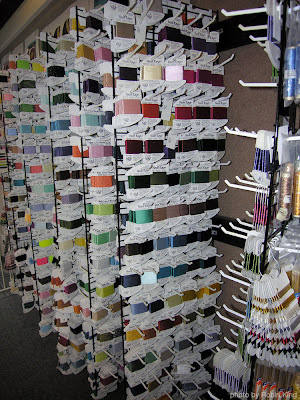 Look how the Threads were mounted to the wall. Easy to view and select. An excellent use of vertical space. The class was held in a large conference room located above the shop. Talk about convenience. Comfy chairs. Excellent lighting. Plenty of space to spread out and stitch! Judy made special gifts for each attendee: Flower Magnets. Look how creative she was... my kind of lady! Love the Flower Magnets made by Judy Greer. Dining, laughing, stitching and girl talk. What a fun time I had. 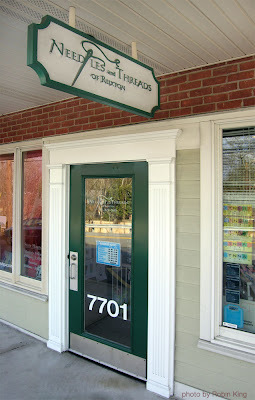 Looking forward to my next visit with Judy and her wonderful customers. Soon it was time to get back on the plane and head home. I had just enough time to do laundry and then it was time to go out of town, again. 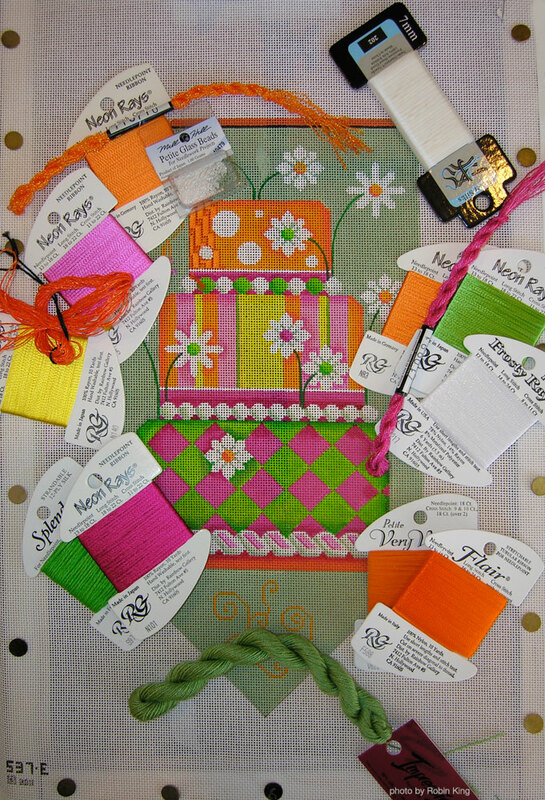 Stitch by Stitch offers many classes and stitching opportunities for their customers. When I arrived the "Saturday" stitchers were there. They have two large tables set up to come in and stitch awhile. Each lady was working on her own project. Stitching. Talking. Laughing. I joined them and did some stitching myself. It felt good. As I travel, I enjoy noting the various nuances of each shop. Betty and Madalena are very proud of their customers stitching, and showcase the finished pieces on the walls and shelves. This time, they were collecting new pieces to display... all Charley Harper canvases. What a treat to see. And, what a great way to announce their Charley Harper Trunk Show during the month of March. Stitch by Stitch really is a Needlepoint Gallery. The first teaching day was the Flowers in a Vase (ND 311) by NeedleDeeva. There were 12 ladies in attendance. 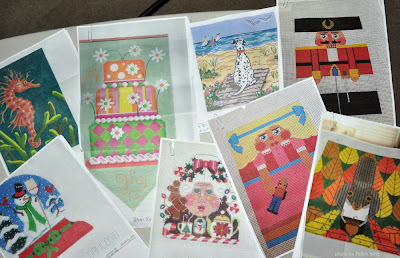 Each learned the Stumpwork, Messy Beading, Loopy Turkey Work, Ribbon Work, and the many fun composite stitches. 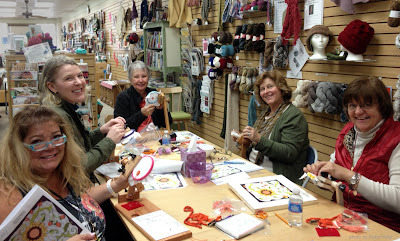 I received many compliments about how much they enjoyed the class. The pleasure was all mine! The second teaching day was a Canvas Enhancement class. Each customer has selected a canvas and I gave them stitch and thread suggestions. Because of my traveling schedule, I had asked Betty and Madalena to send me color copies of each canvas ahead of time so I could "ponder" at my convenience. These are the canvases which were sent to me. There are now Stitch Guides for each of these canvases. 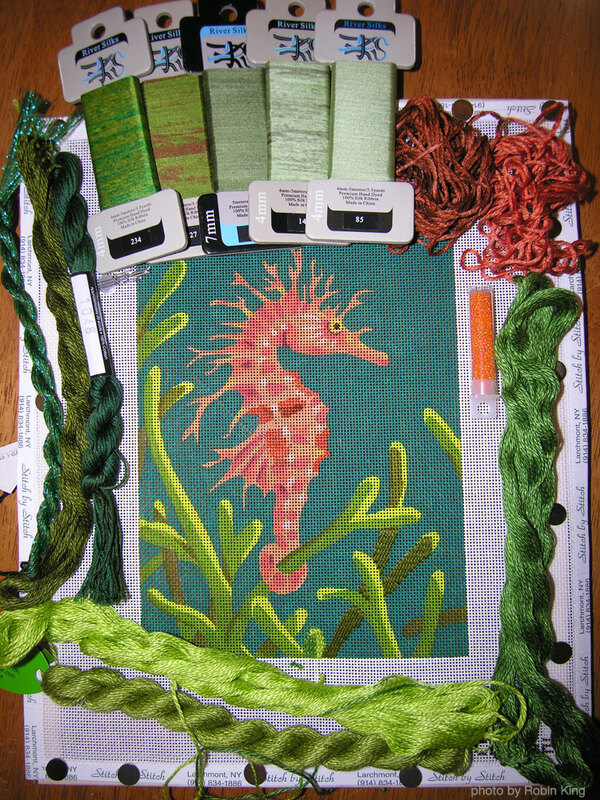 Here are some of their canvases with the suggested threads pulled. 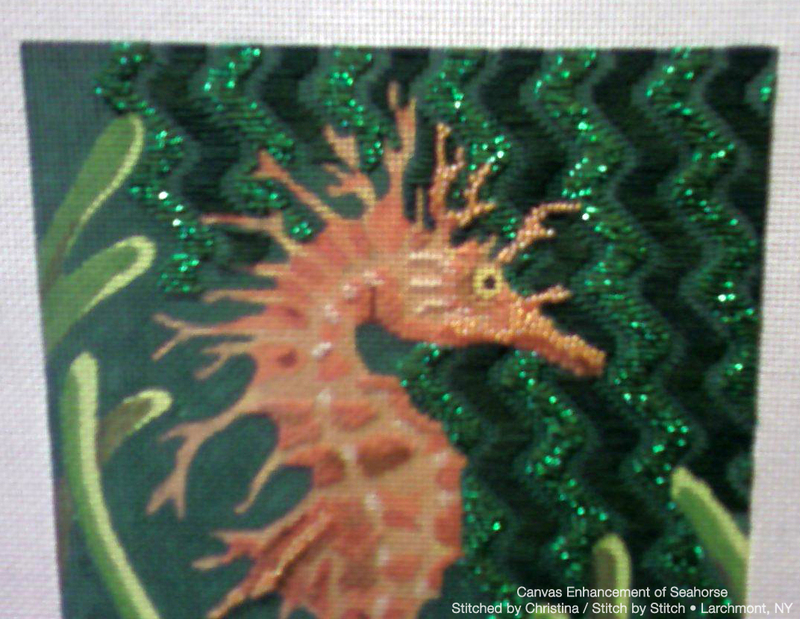 Christina liked my suggestions for the Orange Seahorse so much she sent me a photo. Don't you love it?! 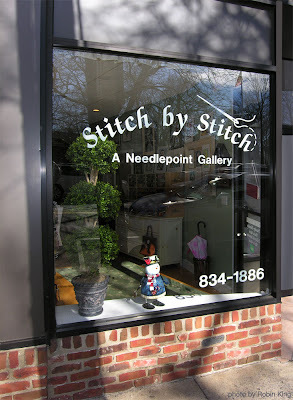 I had a lovely time at Stitch by Stitch. I am looking forward to returning. There are still many restaurants to visit and cocktails to explore. LOL. I also want to especially thank Kathy for her fabulous hosting. Very good for the soul. So now, I am home. Back in Memphis. Working in front of the computer. 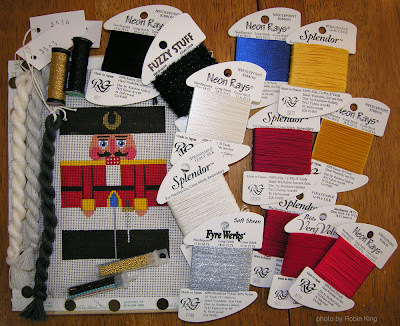 Writing stitch guides. Stitching models. Making preparations for my next out of town teaching jobs. Busy, busy. Fun, fun, fun.